From 1916 to 1921 [to 1923]? The last two corridors that I have recorded in the west wing of Kilmainham Gaol have been interesting for a number of reasons. 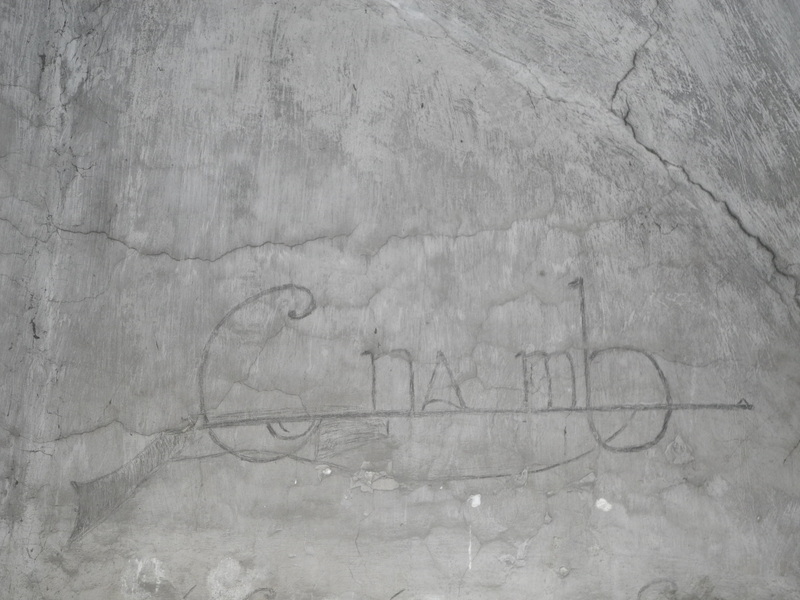 There has been some prominent and very interesting graffiti – including Sighle Humphries’ cell that has slogans on many walls, the Cumann na mBan logo (the female equivalent of the Irish Volunteers, which most of the imprisoned women were members of) and a small piece of pencil text that describes the location of a tunnel that the women were digging in 1923 (it was subsequently found by the authorities). There are also quite a few cells that have plaques noting that they held men (and one woman – the previously named Sighle) who were imprisoned during the War of Independence (1919-1921). The cells that held famous names from the War of Independence have plaques above the door that were added early in the life of the prison as it transitioned to a museum. These plaques have been mentioned before in relation to the 1916 corridor and there are infinitely more cells identified on this floor than on any other. Infact the top floor is not open to the public and therefore there are no plaques above the doors and the ground floor is infrequently used for tours other than as a quick route to the prison yards, where the 1916 leaders were executed. So the large number of plaques relate to one floor and indicate that the memories of place of members of the Kilmainham Jail Restoration Society remained sharp decades after they had been held at the site. Indeed, one can see the names of the most famous inhabitant of a cell on these two corridors written in chalk on the back of the cell door in many cases. 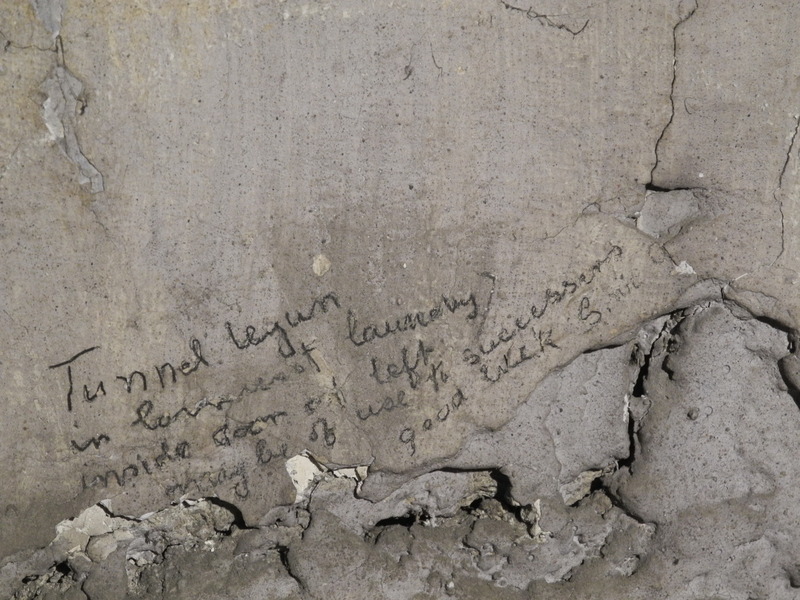 However, the graffiti inside the cells reveals faulty – either deliberate or unintentional – memories for some of the cell inhabitants. One of the cells that is named apparently held Simon Weafer, who interestingly hasn’t written his name in this cell but has done in a number of other cells on the corridor. Whereas graffiti signatures at Kilmainham are not always tied spatially to the cell that the person occupied – there are a number of examples of men and women who have written there names throughout the wing – it is rare for a name to appear in other cells but not appear where they had spent their term of imprisonment. Perhaps a larger lapse of memory is the designation for Sighle Humphries, one of only two women who have a plaque above their cells doors in this wing. Due to the lavish decorations and large amounts of text in the cell that relate to its most famous occupant it is clear that Sighle occupied the cell in 1923, not 1921. This may appear to be a small slip but infact ‘officially’ places her imprisonment during the War of Independence – when the Irish rebels fought side-by-side against the British and narratives of war and resolution were simple and enemies were easily defined. Infact Sighle was imprisoned during 1923, which was during the Irish Civil War. Whereas Margaret Ward notes that c.50 women were imprisoned during the War of Independence by the British it was during the Irish Civil War that the women first experienced mass political imprisonment, when it is estimated around 500 were held. Sighle, like the other women who were held at Kilmainham and other sites of female incarceration, was effectively imprisoned by their own side. She – along with the other women – were not afraid to articulate their hatred and bitterness at their ex-comrades who were now their jailers in graffiti. The animosity felt towards those who held her captive, her comrades of only a few short years before, was clearly articulated on a piece of graffiti written large on her wall: ‘Men and Measures may come and go / But principles are eternal’. Indeed, civil war imprisonment – despite being the last phase and therefore leaving the most lasting traces, is largely ignored in preference for its less controversial predecessors – the Easter Rising and War of Independence in the interpretation of the wing. There are a small number of cells that record civil war occupants but generally these are for specific reasons – Grace Gifford’s cell in the East Wing has a note stating she was imprisoned during 1923 due to the heavily restored mural of the Madonna and child that remains in her cell and is viewable through holes in the locked cell. Also the only plaque on the ground floor of the West Wing relates to Eamon DeValera’s imprisonment – when he was the last political prisoner to be released in early 1924 and therefore the last prisoner held in the prison. Maybe it is time – as we head into the ‘Decade of Commemorations’ to re-install the many civil war narratives into Kilmainham and begin to deal with the difficult and uncomfortable memories of civil war by firstly acknowledging the imprisonment that occurred during this time.